About a century after their discovery, chromatography techniques have become extremely important in instrumental analytical chemistry. They contribute to the solution of analytical problems which would otherwise be impossible to tackle. Think, for example, of multiresidual analysis (pesticides, herbicides, etc.) of fruit and vegetables, which makes it possible to control the use of (about a thousand) substances that are in some cases highly toxic to people and animals. Chromatography was an incidental discovery, but it has become essential for dealing with analytical problems whose complexity has continued to increase and which requires even the separation of chiral compounds (substances which only differ in the spatial arrangment of substituents around a chiral carbon or, in more general terms, which are not overlapping – called “stereoisomers”). Experiment: Tswett had mixtures of coloured plant pigments pass through a glass column filled with calcium carbonate. The pigments separated into single coloured bands along the column. The word chromatography derives from the combination of the Greek words chroma (colour) and graphein (write). Through his experiment (see right) Tswett showed how this fractionation technique could be used, thus laying the foundations for modern chromatography. 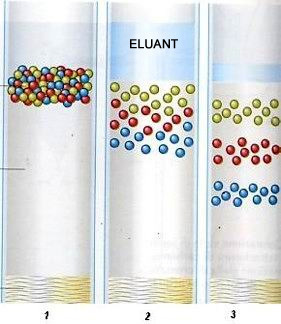 The term ‘Chromatography’ is currently used to refer to all the separation and/or analytical techniques based on separation by distribution between two phases: a stationary phase (immobilised) and a mobile phase (eluent). 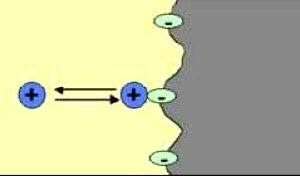 A chemical species deposited on the stationary phase, and introduced into the flow of the mobile phase, will distribute itself dynamically between the two phases, in proportion to the affinity it shares with them. The mobile phase is usually a liquid or gas which flows continuously over the stationary phase, which may be a solid or a liquid, carrying with it the solutes that make up the mixture that causes the extraction. 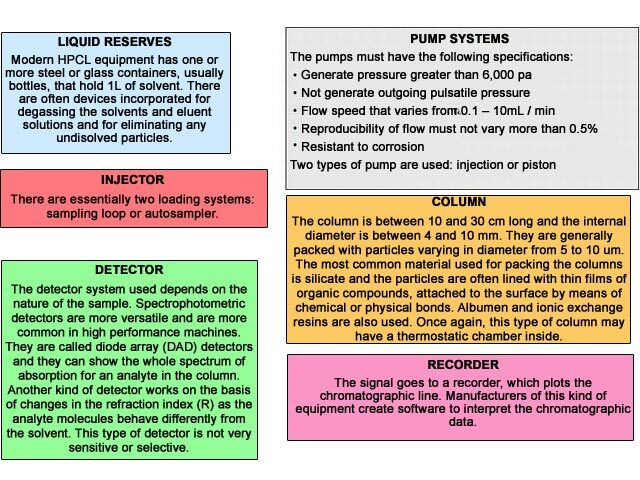 Four chromatography techniques are obtained by the combination of the mobile and stationary phases. Consider a two-phase system into which an analyte is introduced: it will distribute itself between the two immiscible phases, S and M, depending on its chemo-physical properties. If CM and CS are the substance’s concentrations in the mobile and in the stationery phases respectively, and assuming that the experimental conditions are such as to reach equilibrium, it is possible, at a given temperature, to represent the distribution coefficient (K). The value of K is related to the retention time, that is the time needed for an analyte to go through the entire stationary phase. A higher concentration in the stationary phase than in the mobile phase, points to a greater affinity for the former one. In other words, it will be difficult for the eluent to carry certain substances with it, while others with a greater affinity and not as close to the stationery phase, will be moved away from where they are located, and carried towards the end of the column. This way, the substances with smaller affinity for the stationery phase will be separated by those mostly retained. 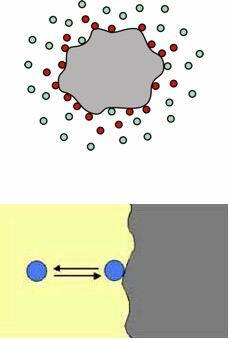 Assume you have five columns, evenly filled with a solid material in granules of homogeneous size (stationary phase). 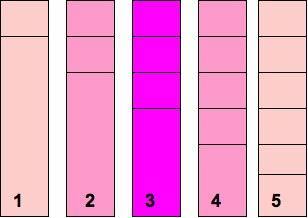 An analyte with K=1 deposits itself at the beginning of the first column, which means it is equally distributed between the stationary phase and the mobile phase. Phase 1: 1 ml of analyte is added to tube 1. Phase 2: being K=1, when equilibrium is reached, 0.50 ml will be in the M phase, and 0.50 ml in the S phase. The whole mobile phase is transferred to tube 2, where the amount of the analyte will be 0.50 ml. Phase 3: being K=1 in tube 1, the analyte distributes itself in the M and S phases in the quantities equal to 0.25 and 0.25 ml respectively. In tube 2, the distribution between the two phases will also be equal to 0.25 and 0.25 ml. Now, if the whole mobile phase of tube 2 is transferred to tube 3, the analyte concentration in tube 2 and 3 will be equal to 0.25 ml. In addition, if the whole mobile phase of tube 1 is put in tube 2, the amount of analyte will be equal to 0.50 ml in tube 2 and 0.25 ml in tube 1. Phase 4: the same could be said of this phase. Once equilibrium is reached the analyte concentration between the two phases is 0.125 ml, 0.25 ml and 0.125 ml in tubes 1,2 and 3 respectively. Therefore, if the whole mobile phase of tube 3 is transferred to tube 4, the amount of analyte in the latter will be equal to 0.125 ml. If the whole mobile phase of tube 2 is transferred to tube 3, the amount of substance will be equal to 0.375 ml. Finally, if the whole mobile phase of tube 1 istransferred to tube 2, the final amount of analyte will be equal to 0.375 ml. Only 0.125 ml of substance will be left in tube 1. Phase 5: at equilibrium, the amount of substance examined will be 0.0625 ml, 0.1875 ml, 0.1875 ml and 0.0625 ml in tubes 1,2,3 and 4 respectively. If the whole mobile phase of tube 4 is transferred to tube 5 the amount of analyte will be equal to 0.0625 ml. Continuing in the same way, as shown in example 4, at the end of experiment the amount of substance will be 0.0625 ml, 0.250 ml, 0.375 ml, 0.250 ml and 0.0625 ml in tubes 1,2,3,4 and 5 respectively. the number of equilibriums reached. Table shows progress of the substances in the 5 tubes during experiment. Each phase corresponds to an equilibrium. The diagram on the right shows the pattern of the analyte studied above, with the points distributed along a Gaussian curve. 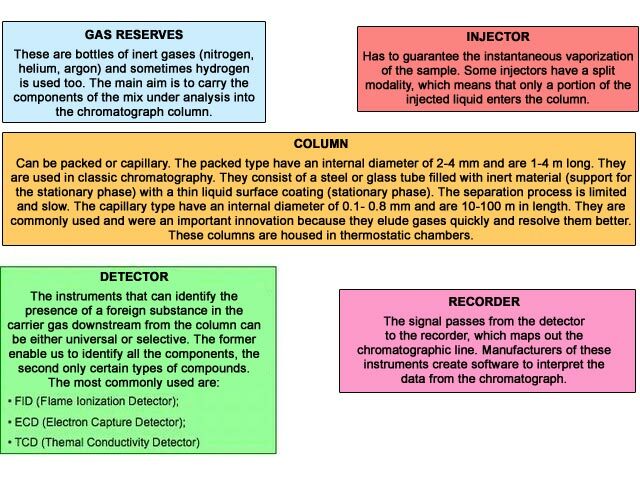 The chromatogram is the diagram produced by a chromatographic analysis, which relates the response of the gas-chromotography detector to the time, i.e. the elution volume. Each peak represents the elution of the single analytes separated in the chromotographic process. It should be pointed out that N is not a characteristic of a given column because it is related to the eluted substance. This means that if different substances flow through the same column, the column will exhibit two different theoretical plates values. The diagram on the right shows the pattern of the analyte studied above. We note that the points are distributed along a Gaussian curve. The chromatogram is the diagram produced by a chromatographic analysis, which relates the response of the gas-chromatography detector tothe time, i.e. the elution volume. Each peak represents the elution of the single analytes separated by the chromotographic process. Diagram of a column and theoretical plates (Elements of volume where equilibrium is reached). The substance moves towards the end of the column through the movement of the mobile phase, in equilibrium on a plate, towards the following plate. It should be remarked that, unlike the distillation column, the plates do not actually exist inside the column, they are only a model to clarify the process taking place. An increase in N corresponds to a decrease in the number of theoretical plates over which each substance is distributed, because the equilibriums it is subject to increase as well; if they are of equal length, the part of the column on which each substance is distributed becomes shorter. The efficiency of a column increases with the number of plates: the greater N, the more compact the outgoing band, and the narrower the peak on the chromatogram. By increasing the plates→the peaks are narrower→better separations are obtained. The easiest way to increase the number of plates is to increase the column length, which, however, entails a remarkable increase in retention time. Alternatively, a way must be found to reduce the size of a single plate. With equal column lengths a column will be more efficient when the height equivalent to the theoretical plate is minimised. Where L is the column lenght. The stationary phase is a solid with active sites on its surface which can set up secondary links (dipole/dipole interactions, H/H links, Van der Waals forces) with the different molecules of the mixture to be separated. If the mobile phase is a liquid, the chromatography is called Liquid-Solid Chromatography (LSC); if it is a gas, Gas-Solid Chromatography (GSC). Generally speaking, the molecules that are most easily fixed are those exhibiting polar groups, even if the nature of the adsorbent also affects the phenomenon. 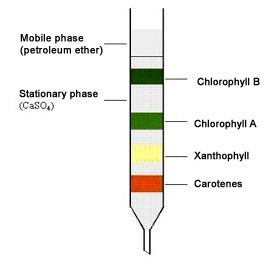 The stationary phase is a liquid and the substances to be analysed dissolve in it. The substances then split between the two phases (which are themselves immiscible). The mobile phase may be a gas (GLC) or a liquid (LLC). Finally, if the stationary phase is polar, the chromatography is called “normal-phase chromatography”, while if it is apolar, it is called “reversed-phase chromatography”. This is based on an ion exchange equilibrium between a resin (stationary phase), and a mobile electrolyte solution. More specifically, the stationary phase involves macromolecules containing active groups with an electric (positive or negative) charge, which can exchange their counterions (negative or positive, respectively), with the solution they come into contact with. 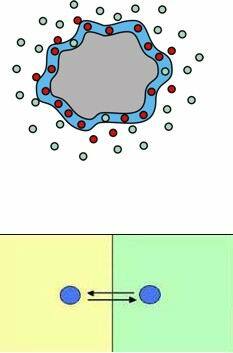 The stationary phase consists of a gel with controlled-size pores; the separation is based on the size and molecular mass of the analytes. Reversible, very specific biochemical reactions are used, so that the molecules to be separated interact with the stationary phase. 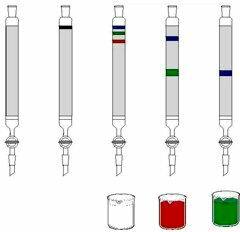 Qualitative analysis is based on information obtained from the chromatogram, which provides firm evidence of the presence or lack of analytes. If the analysis of a sample does not produce a peak at the same reaction time as a standard obtained in the same conditions, one may conclude that the compound concerned is almost certainly not present in the mixture. Another technique is based on enriching the sample with a small part of the pure analyte that we want to test for. If a new peak appears in the chromatogram, the known species is not present in the mixture; if no peak appears, on the other hand, the analyte is present. The limited information provided by a chromatogram (especially retention time) means that separation of complex samples of unknown composition is not always possible. This limitation is bypassed by interfacing chromotography columns with UV, IR or mass spectrometers. Quantitatives analysis is based on the comparison of the heights of areas of the peaks of a compound present in a sample, with those of one or more standard ones. The area of the peak is usually a better measurement than height. As was shown in previous lessons, the most direct method in quantitative analysis is to prepare a number of standard solutions with concentrations similar to that of the sample. The chromatograms of the standards are produced and the heights or areas of the peak are reported along with the concentration. Analysing the triglyceride component is complex because of the presence of compounds with only slight chemo-physical differences. For this reason, matrixes with a mainly triglyceride composition are preferred (e.g. butter, oil, lard, etc.) for their distribution in fatty acids. This analysis can be performed by doing a transesterification reaction on the fat or oil which breaks up the triglycerides, and frees the fatty acids they contain. sophistication: fraudulent replacement of certain ingredients with cheaper ones. seeds oils mixed with intensely-coloured olive oil (second-extraction, low-quality olive oil). 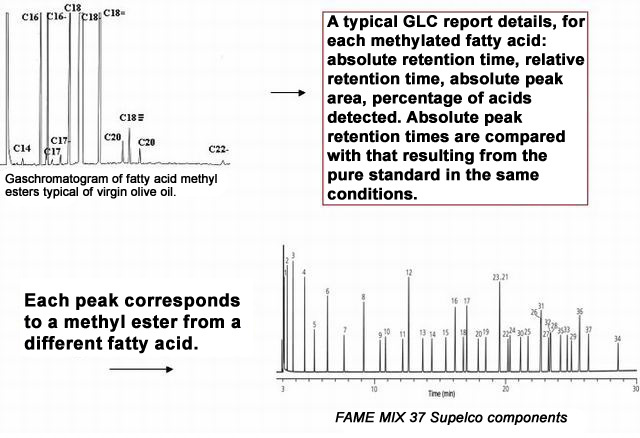 Gas chromatography of fatty acids (like Methyl Esters) produces a chromatogram with clear peaks for all the fatty acids, including those present in trace amounts or with different isomers (cis-isomers can be distinguished from trans-isomers). 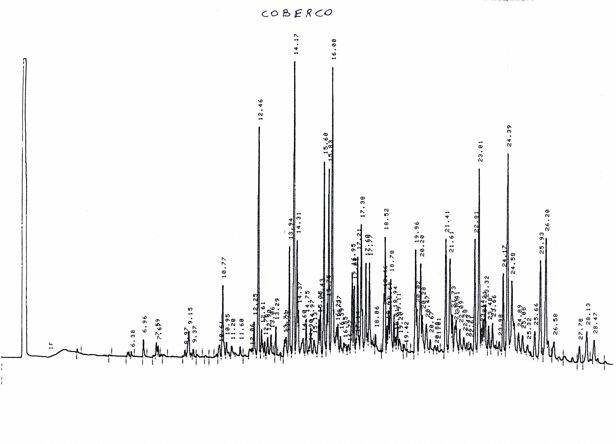 Special capillary columns can also produce a chromatogram showing the peak typical of elaidinic acid that indicates an olive oil that has not been pressed and probably comes from esterefied olive oils, rectified olive oils or rectified olive-pomace oils. 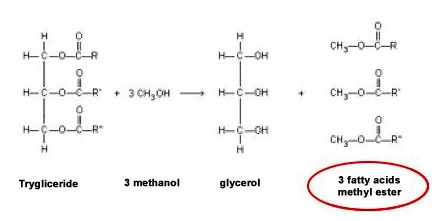 By a process of transesterification, the fatty acids of glycerides present in the olive oil are transformed into their respective methyl esters, which exhibit greater volatility compared to simple triglyceride. 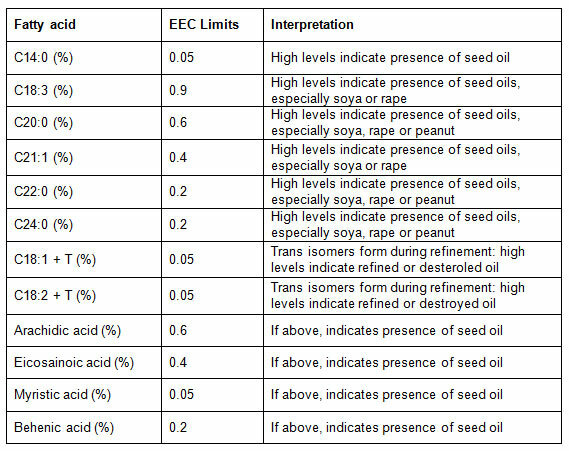 The quality of oil can be checked by comparing percentages of methylated fatty acids.